This exciting flavour is a modern twist on The Classic. MadeGood® Chocolate Chip Crispy Squares are still delightfully crunchy and sweet but the Chocolate Chips take it up a notch. Prepare to be delighted. But they are also healthy with the nutrients of 6 hidden vegetables, gluten free and vegan. And of course, as with all MadeGood snacks these treats are organic, non GMO and school safe. Can’t wait for snack time? MadeGood® Crispy Squares are made in the same nut free dedicated facility as our granola bars and minis. Made from a very simple recipe, our Crispy Squares contain rice crisps with lots of crunch and cane sugar syrup for sweetness. They are a healthier, simpler version of everyone’s favourite childhood snack. 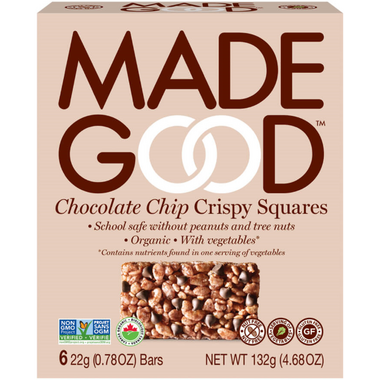 MadeGood® Crispy Squares are organic, gluten free, Non-GMO project verified and contain the nutrients of one full serving of vegetables from six different sources. And, of course free, from the 8 most common allergens. These fun little treats come in boxes of 6 individually wrapped servings and two delicious flavours; Vanilla and Chocolate Chip. Ingredients: Crisp rice*, cane sugar syrup*, chocolate chips* (cane sugar*, cocoa liquor*, cocoa butter*, vanilla*), sustainable palm fruit oil*, vegetable glycerin*, cane sugar*, cocoa powder*, sunflower oil blend* (sunflower oil*, mixed tocopherols, rosemary extract*), sea salt, vegetable powder (spinach, broccoli, carrots, tomatoes, beets, shiitake mushrooms), vanilla flavour*, agar*. Like a luxury rice krispie square! It's yummy but not as chocolatey or sweet as I'd like so this would be perfect for those who prefer a milder tasting snack. Perfect for my kids school lunch. Kids really enjoy them. Only rated them a 4 as I find they are missing a little something taste wise but still good. A little bland, but a nice treat for those with dietary restrictions. We buy many of the Made Good products and these are a big hit in our house. They're a treat that I can feel good about serving my children. Bonus - the hidden vegetable serving in each bar. Crispy and chewy, oats rolled together into a chocolate granola type bar. It's a filling snack. These are a great addition to school lunches. Nice treat. Perfect for the lunch box. It never comes back uneaten. My son loves them. 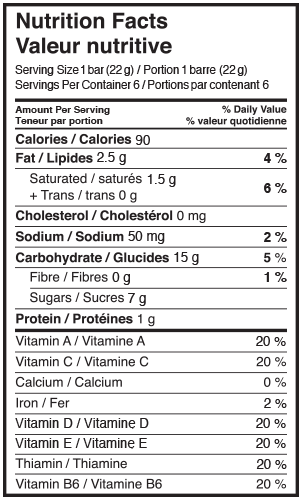 Great allergens free product with a good nutritional value and a great taste.